Earlier in this series, I accused the NBA franchise currently residing in the nation’s capital of having an identity crisis. That organization has played in three different cities under six different names. Well, there’s a team in Northern California that would like to throw its hat into that ring. Over its 62-year history, the franchise currently (who knows for how long?) known as the Sacramento Kings has been associated with five different cities and undergone one name change. For a franchise that’s made 29 playoff appearances, played in eight conference finals, won a championship and had 10 Hall of Famers suit up in at least 200 games (good luck finding a color photo of most of them), the Kings have endured a staggering amount of misfortune, mismanagement, mediocrity or downright putridity. The franchise began in 1948 as the Rochester Royals. After one year in the Basketball Association of America in which they posted a league-best 45 wins (in a 60-game season) and reached the conference finals, they joined the NBA, where they reached the playoffs each of the next six seasons, with a .600+ winning percentage in each of the next five, took part in three conference finals and, led by Arnie Risen, captured the only championship in franchise history in 1950-51. After nine years in Western New York, the Royals relocated to Cincinnati before the 1957-58 season. The team’s first four seasons in Ohio were generally unremarkable (all sub-.500, one playoff appearance), until a 1961 territorial draft pick changed the franchise’s fortunes. More on this shortly, but a funny thing about Oscar’s run with the Cincinnati Royals is that most fans are hard-pressed to cite anything other than “he averaged a triple-double.” While that is undoubtedly true and phenomenal, details about the length of his tenure (10 years) and the team’s success (six playoff appearances in nine years; two conference finals appearances) are nowhere near as widespread in their recognition. Think about it. If you eliminate “triple-double” from the vernacular, Oscar Robertson’s prime is murky at best, right? The Royals stumbled in the late 1960s and early 1970s, missing the playoffs in Oscar’s last three seasons and the four that followed. In 1972, two years after Robertson was dealt to the Bucks, the Royals left Cincinnati and headed for corn country. They started the 1972-73 season as the Kansas City- Omaha Kings. A quick side note: I am all for inclusiveness, but this was a bit much. K.C. and Omaha are separated by about 200 miles and a state line. If you enjoy mocking the Los Angeles Angels of Anaheim, go to town on this one. Anyway, after missing the playoff each of their first two seasons as the K.C.-Omaha Kings, the 1974-75 team, led by Nate “Tiny” Archibald and Jimmie Walker (Jalen Rose’s father), won 44 games and earned a spot in the postseason. They were eliminated by the Chicago Bulls in six games. That summer, the powers that be got together and took a look at the team’s name- Kansas City- Omaha Kings. I’d imagine that at some point during that meeting, someone said “Hey! You guys know these are two different cities in two different states?” which led to the “Kansas City Kings.” (Note: What actually happened was that, after splitting its home games between the two cities, the franchise elected to abandon the Omaha market in 1975; although I hope one of the geniuses in charge came to the aforementioned realization). After three more losing seasons, now as the “Kansas City Kings,” the teams enjoyed a period of relative success in the late 1970s and early 1980s. In the seven seasons between 1978 and 1985, the Kings finished over .500 four times, made five trips to the postseason and appeared in the saddest Western Conference Finals series in memory in 1981. That year, despite three teams in the West winning 52+ games, the 40-42 Kings and the 40-42 Rockets combined to pull three upsets and battled for the right to be extras in Larry Bird’s coronation. Yeah, that passes for prosperity ‘round here. However, this “success” was short-lived, as a number of factors combined to doom the Kings in Kansas City. First, during the 1979-80 season, a severe storm caved in the roof of the team’s arena. After a literal caving in of the roof, a figurative one got rolling. First, Ted Stepien, the craziest owner in Cleveland Cavaliers history (a competitive category) offered huge free agent contracts to Otis Birdsong and Scott Wedman, the Kings’ best players. This was followed by the team being sold to a group from Sacramento for just $11 million dollars. In the summer of 1985, amid flagging attendance, ownership pulled the Kings from Kansas City, moving the team to Sacramento. Before we move one to the Sacramento era, a piece of information that I have no idea what to do with but is good for a chuckle. Late in their Kansas City run, the Kings’ general manager was fired in a scandal in which he was found to be reusing previously used postage stamps. In light of this, the Kings ran back into the waiting arms of Joe Axelson, the former GM who had traded away Oscar Robertson, Norm Van Lier, Nate Archibald and Jerry Lucas. That’s the caliber of leadership we’re talking about here! The Kings’ first year in California, while lackluster, was not all bad. Despite finishing the regular season with a 37-45 record, the Sacramento Kings managed to treat their new fans to the postseason experience- such as it was. The 1985-86 Kings earned the eighth seed in the Western Conference and drew the 62-win juggernaut Lakers in the first round. They were not only swept in three games, they endured as savage a beating as has ever been seen by a professional team. The Lakers won each game by just under 31 points, none by less than 20, and dropped a 47-point beatdown (135- 88) in Game 1. This was sort of a precursor of things to come. The Kings failed to win as many as 40 games in a season over the next dozen years, nine times failing to win 30 games, and made a single playoff appearance, losing to the Seattle Supersonics in four games in 1996. However, starting in 1999, when the team drafted flashy PG Jason Williams (White Chocolate or Slim Shadey to some) out of Florida and acquired Chris Webber from the Washington Bullets (the other name-crazy team! ), optimism began to build. The Kings, so sad for so long, were suddenly young, entertaining and competitive! The young, brash team won 27 of 50 games (.540 winning percentage) in the lockout-shortened 1999 season, exhibited some spectacular play, and pushed the Utah Jazz to the limit in the first round of the playoffs before falling in five games. The Kings won 99 games over the next two seasons and won their first playoff series in more than two decades in 2001, knocking off the Phoenix Suns before losing four straight to a Lakers team that lost a single game that entire postseason. Following that season, the flashy but inconsistent Williams was dealt to the Grizzlies in exchange for Mike Bibby. Bibby would team with Webber, Vlade Divac, Peja Stojakovic, Bobby Jackson and a SG whom I refuse to name (Whatever man! Get your wife to smack me with her purse!) to win 175 games over the next three years (including a franchise-record 61 in 2001-02) and push the third of the Kobe-Shaq title teams to the brink in the 2002 conference finals. To categorize a young Oscar Robertson as merely a point guard is overly simplistic. When Oscar hit the NBA, he was a force of nature. A unique prototype the like of which the league had never seen. 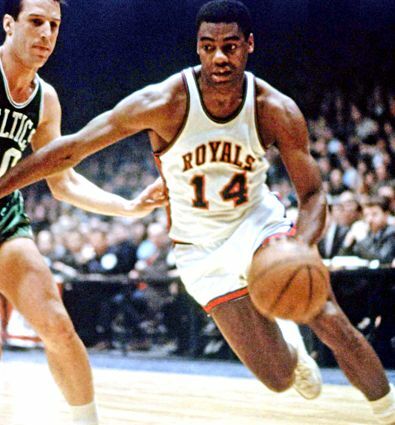 Oscar Robertson was LeBron James, only forty years earlier. Individually, Oscar was every bit as dominant a force as Wilt or Jordan. Through fives seasons, his WORST regular season stat line was 28.3 ppg, 10.4 rpg and 9.5 apg. Robertson spent a decade at the point for the Royals. Eight times he averaged 28.3 ppg or better, never less than 24.7 ppg. Fives time he averaged 9 rpg or better, never less than 6 rpg. He dished out at least 10.7 apg fives and 9.5 apg nine times (8.1 in his 10th year). By now we’ve all heard that he averaged a triple-double in 1961-62 (30.8 ppg, 12.5 rpg, 11.4 apg), but you may not know that he was damn close three other times: his unfathomable 30.1- 10.1- 9.7 as a rookie (I’m reasonably sure he won Rookie of the Year), his “subpar” 28.3- 10.4- 9.5 in 1962-63 and his 31.4 ppg, 9.9 rpg, 11 apg in 1963-64, when he won his only MVP award. That’s not even counting his 30.4- 9- 11.5 in 1964-65! Oscar was an All-Star each of his 10 seasons with the Royals (duh! ), won three All-Star MVP awards and was named All-NBA First Team each of his first nine seasons. The year he missed? He put up 25.3- 6.1- 8.1. Tough crowd! You could argue that he entered the NBA during the perfect era for huge rebounding numbers- and you’d be right- but that does little to diminish the fact that Robertson is the greatest statistical wonder in NBA history not named Wilt Chamberlain. You could also argue that Oscar thrived in an era in which most backcourt players were small, unathletic white guys. You’d be right on that count too. I’d simply counter that while this helped him on the court, Oscar began his career during racial segregation and spent the rest of it in an America that was… let’s just say there was still some work to do on the civil rights front. I’d say that at the very least, that balances the scales, no? Coming in a distant second here is a young Nate Archibald. Before “Nate Archibald” was a Gossip Girl character, “Tiny” Archibald was the prequel to Isiah Thomas and Allen Iverson. Bronx-born Archibald was lightening quick, an exceptional ballhander, an awesome scorer and toughened by the New York playgrounds of the 1960s. Archibald spent six seasons (five of them healthy) with the Royals-Kings, averaged 25.6 ppg and 8.1 apg, earned three All-NBA First Team selections, one Second-Team All-NBA nod and was named an All-Star three times. His 1976 All-Star Game performance is one of the most impressive ever by non-MVP. In addition to 13 points and sevens assists, 6’1”, 150-pound Tiny grabbed 15 rebounds (10 more than Kareem!) in a game that also featured (in their primes) Elvin Hayes, Bob McAdoo, and Dave Cowens. In four healthy, non-rookie seasons, Archibald never averaged worse than 24.8 ppg and 6.8 apg. In his two-year “prime prime” (1971-72 and 1972-73), Tiny put up 28.2 ppg and 9.2 apg, and followed it up by averaging a ridiculous 34 ppg and 11.2 apg and famously becoming the only player to lead the NBA is scoring and assists in the same season. But it happened on a 36-46 team. That’s the thing. The story of young Nate Archibald is a solo act. His six seasons with the franchise yielded just one winning season, one postseason appearance (bounced in six games; he averaged 20- 5 after a 26.5- 6.8 regular season) and no more than 36 wins in any other season. Individually, he was as good as any lead guard that had come before or has come along since, but he lacked the spark that Isiah (and to a lesser extent Iverson) personified, that placed winning above everything else, all the time. Finally, we have Mike Bibby, who averaged 17.6 ppg, 3.2 rpg and 5.4 apg in 476 games running the point for the Kings. Only averaged 20+ ppg once, never eclipsed 6.8 apg and was never named an All-Star. Compared to the previous two guys in this category, Mike Bibby’s resume is pretty shabby. So why give him a shout out? Although his total body of work is very good but unspectacular, at his best, Mike Bibby was the best big game point guard since Isiah Thomas. Mike Bibby never had to “learn how to be tough,” he was a legitimate playoff badass. In the 2002 Western Conference Finals, in his first NBA postseason (after three years with some awful Grizzlies teams), at age 23, against a two-time defending champion juggernaut, Bibby was there, willing and eager, to take every big shot for the King. Maybe I am overvaluing one transcendent series, but during the 2002 Western Conference Finals, Mike Bibby was not of this planet. Every time the Kings needed a guy to step up, there he was. He may have missed a big shot at some point in that series, but I can’t remember it. And remember Game 7, also known as the “Shrinking Violet Special?” The only member of the Kings that actually showed up? Mike Bibby, who put up 29- 5- 4 and made six of his eight free throw attempts. If Chris Webber was the face of the 2000-04 Kings, Mike Bibby was their balls. Until the arrival of Chris Webber, Richmond was the best player in the history of the Sacramento Kings. After three outstanding seasons with the Golden State Warriors, Richmond was traded to the Kings in exchange for Billy Owens, the fourth pick in the 1991 draft. In his time in Sacramento, Richmond was one of the NBA’s most consistent and prolific scorers. Three times Richmond was named to the All-NBA Second Team (1994, 1995 and 1997) and for six straight years (1993-98) he an All-Star. This feat was made even more impressive by the fact that he never played for a Kings team with a winning record, only twice played for a 35-win team and made a single, four-game playoff appearance. Richmond was named MVP of the 1995 All-Star Game in Phoenix, when he led all scorers with 23 points as the West cruised to a 27-point victory. 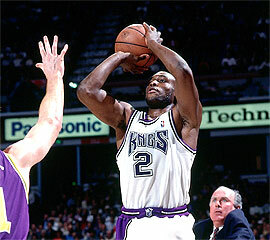 In each of his seven seasons with the Kings, Richmond averaged between 21.9 and 25.9 ppg. Five times he averaged at least 4 apg, including a career-high 5.1 apg in 1991-92. In franchise history, Richmond ranks near the top in virtually every category. He trails only Peja Stojakovic in 3-pointers attempted (2,461) and 3-pointers made (993). He’s third in points (12,070), FG attempted (9,338) and made (4,230) and steals (670). He ranks fourth in franchise history in scoring average (23.3 ppg), 3-point percentage (40.3%), FT attempted (3,088) and FT made (2,617), and is fourth among guards in franchise history with 1,933 rebounds. Mitch Richmond was the only bright light in an otherwise desolate period for the franchise. Another Kings’ two-guard that’s deserving of a mention here is former University of Houston superstar Otis Birdsong. Birdsong was selected second overall by Kansas City in the 1977 draft. He spent his first four seasons with the Kings, earned three All-Star selections and averaged 21.2 ppg (5th in franchise history) on 51.3% from the field. Birdsong averaged 21+ ppg in three of his four seasons as a King, including a career high 24.6 ppg in 1980-81. Given his status as one of the NBA’s first great scorers, it’s a bit surprising that Jack Twyman’s name is not more prominent in NBA history. A 6' 6" small forward from the University of Cincinnati, Twyman spent his entire 11-year career with the Rochester/Cincinnati Royals. He was selected All-NBA Second Team twice (1960 and 1962) and named an All-Star team six times (probably should have been seven straight- more on this in a sec). Twyman scored a game-high 27 points in the 1960 All-Star Game, which featured the likes of Wilt Chamberlain, Elgin Baylor and Bob Pettit. In 1959-60, Wilt Chamberlain’s rookie year, Twyman and Wilt became the first NBA players ever to average 30+ ppg. Wilt led the league at 37.6 ppg and Tyman was second, averaging 31.2 ppg. Twyman averaged 15+ ppg in eight of his 11 seasons, and 22+ four times. During that four-year peak Twyman also had the best rebounding seasons of his career, averaging no worse than 8 rpg and grabbing a career high 9.1 in 1958-59 (to go with 25.8 ppg). His best season was the aforementioned 1959-60 season, when in addition to 31.2 ppg, Twyman averaged 8.9 rpg and 3.5 apg. The following season, Twyman averaged 25.3 ppg (5th in the league; also 5th in total points), 8.5 rpg and shot a career-high and 48.8% from the field (second-best in the NBA). This was his third straight 25+ ppg season and arguably the second best of his career, but he was somehow left off the All-Star team. Jack Twyman reached the postseason in six of his 11 seasons with the Royals, including two trips to the conference finals. In 34 career playoff games, Twyman averaged a solid but unspectacular 18.3 ppg and 7,5 rpg. From 1955-56 through 1965-66, no one played in more games (823), scored more points (15,840; over 7,000 ahead of #2) and attempted (13,783) or made (6,237) more field goals. For that same stretch, Twyman ranks second in rebounds (5,424), assists (1,861), free throws attempted (4,325) and free throws made (3,366). Jack Twyman was inducted into the Basketball Hall of Fame in 1983. Additionally, Twyman is perhaps the best “best friend” in league history. After teammate Maurice Stoke was paralyzed due to a severe head injury, Twyman became his legal guardian and helped with his medical expenses. He also organized the Maurice Stokes Memorial Basketball game in his fallen teammate’s honor, to help raise funds for former players from the NBA's early years (this event lives on to this day, but now in the form of a pro-am golf event). Another talented player who starred at the “3” for the Kings is Tom Van Arsdale. Van Arsdale played for five teams in his 12-year career. 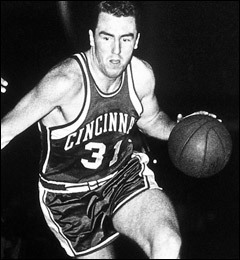 He spent his five best seasons with the Cincinnati Royals in the late 1960s and early 1970s. In each of his four full seasons with the franchise, Van Arsdale averaged at least 19.2 ppg (22.9 over one two-year span) and twice grabbed over 6 rpg. For three straight seasons (1970-72) he was named an All-Star. In 379 games with the Royals-Kings franchise, Tom Van Arsdale averaged a very good 19.2 ppg and 5.1 rpg. Thing is, while Tom Van Arsdale was a very talented player, he was the anti-Bill Russell. Van Arsdale still holds the NBA records for most career games played (929) and most points scored (14,232) by a player that never made a playoff appearance. Chris Webber is the greatest Sacramento King in history and one of the most talented and significant players in franchise history. When he was acquired in a 1998 trade, Chris Webber was seen more as an immensely gifted, but immature head case. Little did anyone know that he would not only produce 5+ stellar seasons in Sacramento, but that he’d deliver hope to the hopeless. When Webber arrived in Sacramento, the Kings had failed to post a winning season in 16 years and had made just three postseason appearances (all first round exits) during that stretch. Starting with his first season, the lockout-shortened 1999 season, the Kings kicked off a franchise-high eight-year postseason streak, advanced past the first round four times and came painfully close to capturing the Western Conference title in 2002, which would have all but guaranteed an NBA title. As good as his 6+ season numbers are, Webber enjoyed an awesome three-year run from 1999- 2002, which included his career-best 2000-01 season, during which he averaged 27.1 ppg, 11.1 rpg, 4.2 apg, 1.7 bpg and was named an All-Star and First Team All-NBA. Not only were his numbers reminiscent of Karl Malone in his prime, Webber’s play that season at both ends of the floor was as good as we’ve seen from a power forward in the past couple of decades. The most valid criticism of C-Webb in his prime stems from his postseason performances. It’s not that he was terrible throughout- he was a consistent 24- 10 in his four best seasons- but that he never showed the ability take over on the biggest stage. In the two biggest games of his career (Game 7 at home against the Lakers in 2002; Game 7 at Minnesota in 2004), Webber failed to play up to his usual standard. Against L.A. in 2002, although Webber put up a solid 20- 8- 11, he was noticeably absent in the closing minutes of the fourth quarter and OT, as Mike Bibby and an ice cold Stojakovic to try and fend of Kobe, Shaq & Friends. However, while 2002 was not the highlight of Webber’s career, Game 7 against KG in 2004 was the most lopsided matchup between top flight big men since Hakeem obliterated David Robinson in 1995. In an 83-80 loss, Webber put up a subpar 16- 8- 4, while KG conjured up a dominating 32-point, 21-rebound, 5-block, 4-steal masterpiece. However, with all of that said, there is ZERO chance that Sacramento Kings of 2000-04 are even a blip on the NBA radar without Chris Webber. You do not get a top postseason seeding, or get to Game 7 without Chris Webber. Thing is, when you’re there, you look for Mike Bibby in crunch time. During his prime, Webber was the most athletic big man in NBA with 20-foot range, a low post game, the ability to run the floor, great rebounding instincts and passing skills that must rank in the top-ten all-time among big men. 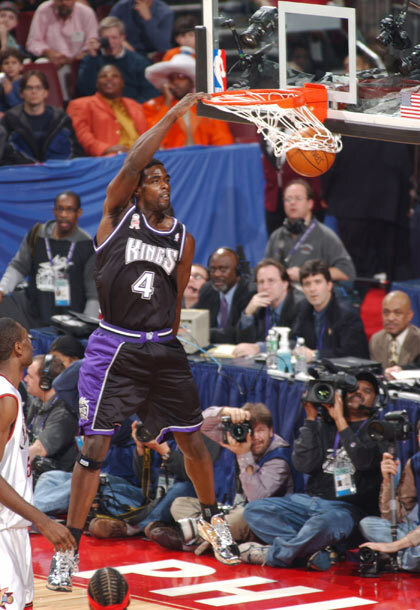 Although he’s been accused of not fulfilling his massive potential, particularly in the postseason, it’s worth pointing out that in his prime in Sac-town, Chris Webber was an All-Star (four straight years), an MVP candidate and one of the four or five best players in the NBA. That’s pretty good! Next up we have Jerry Lucas. Lucas is without a doubt one of the best frontcourt players ever. Thing is, he cannot hold a place in the top tier of NBA greats. Any Hall of Famer that a) spent his prime playing alongside Oscar Robertson in his prime and b) (with the Royals) never had a season in which he averaged worse than 17- 17 needs to have done some significant winning. After reaching the conference finals as a rookie, Lucas only made two more playoff appearances, never advancing past the first round. In his prime, Jerry Lucas never appeared in the Finals, and never won a ring. His only playoff run with Cincinnati that consisted of more than five games came as a rookie, in 1964. That year, he averaged 17.7 ppg and 17.4 rpg, shot 52.7% from the field and won the Rookie of the Year award. However, in 10 postseason games he managed just 12.2 ppg, 12.5 rpg and shot just 39% from the field. However, with that said, Jerry Lucas’ years with the Cincinnati Royals were some of the most productive ever produced by a power forward. He had a fantastic outside jump shot (a rarity for a PF in those days) and capitalized on playing in a fast-paced era that maximized rebounding opportunities. During his six prime years, only Wilt Chamberlain and Bill Russell out-rebounded Jerry Lucas. In three of his six seasons with the Royals, Lucas was good for at least 21 ppg and 19 rpg. He was an All-Star in each of his six full seasons with the Kings (MVP in 1965 with a 25- 10), earned three All-NBA First Team selections and a pair of All-NBA Second Team nods. Lucas was also an incredible workhorse, averaging over 43 minutes in his 465-game run with the Royals. While it’s possible to poke some holes in Jerry Lucas’ resume, there’s no denying his immense talent and on-court productivity. By a significant margin, Jerry Lucas’ 19.1 rpg is a franchise record. Meanwhile, his 8,876 rebounds are second in franchise history and his 20,024 minutes are good for fourth in franchise history. On the scoring front he’s not much worse, as his 19.6 ppg is eighth in franchise history and his 9,107 points seventh. Between Jerry Lucas and Chris Webber, Royals-Kings power forward is pretty stacked. However, there’s another man from the NBA’s early days that deserved recognition. Based on his three-year body of work, there is little reason to believe that he would not have gone down as one of the greatest players of his era, and possibly NBA history, had he been given the opportunity. Tragically, however, Stokes’ had both his basketball career and his life cut short following a head injury that he sustained in the last game of the 1957-58 regular season. In each of his three seasons, Maurice Stokes was named an All-Star (averaged 13 ppg, 14 rpg in three All-Star Games) and was named to the All-NBA Second Team three times. He was inducted into the Basketball Hall of Fame in 2004. His career spanned the Royals’ last two seasons in Rochester and their first in Cincinnati. Stokes charged out of the gate as a rookie, averaging 16.8 ppg, 16.3 rpg (including a 38-rebound game), winning the league’s Rookie of the Year award and earning an All-Star selection. The next season, he set what was at the time the single-season record for rebounds, as he grabbed 1,256 (17.4 per game) while also averaging 15.6 ppg. In 1957-58, Stokes’ last season in the NBA, he produced an outstanding statistical season, averaging 16.9 ppg, 18.1 rpg and 6.4 apg. Then, during the last game of the 1957–58 regular season, tragedy struck. While closing out the season in Minneapolis against the Lakers, Stokes was knocked down on a drive to the basket. He hit his head on the floor and was knocked unconscious. There was initially no concern. He was revived and returned to the game. Three days later, on a flight home after a 12-point, 15-rebound opening-round playoff game in Detroit (the only one of his career), Stoke told a teammate "I feel like I'm going to die," before suffering a seizure and falling into a coma. As a result of the injury (he was diagnosed with "post-traumatic encephalopathy,” a brain injury that damages motor skills) Stoke was permanently paralyzed. Stokes was supported financially for the last dozen years of his life by close friend and teammate Jack Twyman. He died of a heart attack at 36 years of age. This franchise has done well with the Buckeyes! Before Jerry Lucas’ arrival in 1962, the Royals had already found a Hall of Famer from Ohio State: Arnie Risen. 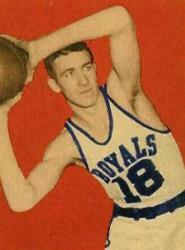 Risen spent his first seven seasons as a pro (1948- 1955) with the Royals and was the clear-cut best player on the only championship team in franchise history. He averaged a double-double in each of his last five seasons with the team and may have done for longer had his first two seasons not predated the tracking of rebounding statistics. Twice he averaged at least 15.6 ppg and 12 rpg and was named an All-Star four straight years (1952-55), and arguably should have taken part in the 1951 game (the first ever), when he averaged 16.3 ppg and 12 rpg. Risen raised his game in the most important postseason run in franchise history. After averaging 16.3- 12 in regular season en route to leading the Royals to a 41- 17 record, Risen was good for 19.5 ppg and 14 rpg in 14 postseason games as the Royals knocked off the New York Knicks in seven games for their lone championship. Coming in a pretty close second here is the statistically superior Wayne Embry, who starred for the Cincinnati Royals during the prime of Oscar Robertson’s career. A healthy chunk of Oscar’s assists went to Embry, with whom he teamed beautifully on the pick-and-roll. In 603 games with the franchise, Embry averaged 14.1 ppg and 10.4 rpg and was selected to five consecutive All-Star teams (1961-65). He averaged a double-double in each of those seasons, including a three-year peak (1961-62 through 1963-64) when he put up 19.8 ppg, 13 rpg, 18.6- 12.3 and 17.3- 11.6. 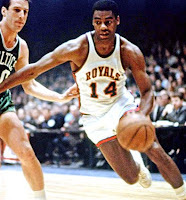 Embry helped the Royals to five consecutive postseason appearances and a pair of conference finals in 1963 and 1964 (both lost to the eventual champion Celtics). Unlike Risen, Embry was never able to carry his regular season form into the postseason, for which he drew strong criticism locally. Embry would go on to a highly successful career in player personnel. With the Milwaukee Bucks, he played a key role in attracting an aging Oscar Robertson, who teamed beautifully with Lew Alcindor to win the only NBA title of his career. Embry went on to become the first African American general manager in NBA history and won the NBA’s Executive of the Year award in 1992 and 1998.